Illumination Fundamental Art (Ifá) Is the word of Olodumare encompassing all knowledge of things past, present and future. Venue: Dunbar Stadium, Oyo town. Against the backdrop of the size of the office the Iku Baba Yeye, His Imperial Majesty, the Alaafin of Oyo, Oba Lamidi Olayiwola Atanda Adeyemi III, has bestowed on me and the larger than life image of my predecessors, my installation as the 15th Aare Ona Kakanfo is a challenge that has made all past challenges seem like a child’s play. Pitiably, as a race, we are gradually losing our culture. In fact, from my travels around the world, it has become obvious that people of other races are taking more interest in our culture than we the owners of the culture, with Americans, Europeans and Asians now earning Degrees in the study of our culture, beliefs and what they have come to term Doctrine. We need to preserve our culture to fully realize the potential of the Yoruba. Also, I will collaborate with security agencies and stakeholders to ensure that Yorubaland is effectively secured through our various organizations. I want to assure this August gathering that given the fact that the Oodua Progressives Union (OPU), which I am also the Convener, is now established in 79 countries, I will use this Union and other pan-Yoruba groups abroad to invite our sons and daughters with exceptional abilities, who have distinguished themselves in various fields, to come home and help in our quest to ensuring that our country takes its rightful place in the comity of nations. The journey has started from here. And my first appeal goes to Yoruba sons and daughters who are outside the shores of the country not to forget that there is no place like home. 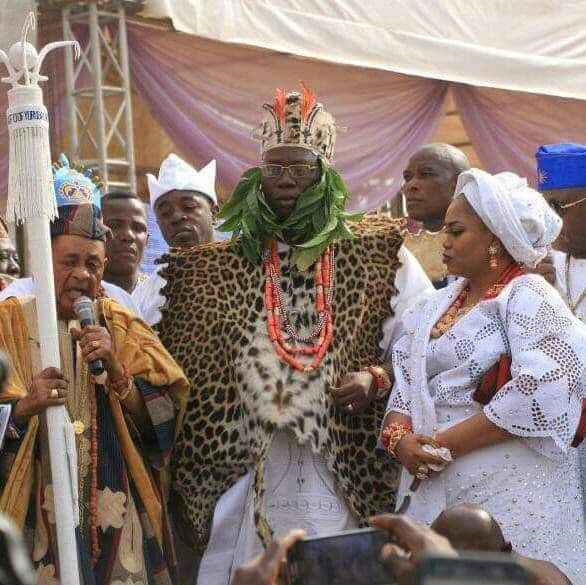 This was what informed the formation of the Oodua Progressives Union (OPU), Gani Adams Foundation and Olokun Festival Foundation. Please, see Yorubaland as the place to be. Don’t give the race a bad name. Come home to invest. 2018 makes it the 30th year that the last holder of the title, Aare M.K.O. Abiola, stood before you for his installation. He died on July 7, 1998 and the post was vacant for almost 20 years. Same happened when the 13th holder of the title, Aare S.L. Akintola, died on January 15, 1966. It took more than 22 years before his successor took over. Why? There is the myth that holders of the title will always die a violent death. But, this is not so because many holders of the title lived to be more than 100 years. From the extreme North of Yorubaland, Arigidi-Akoko in Akoko North West Local Government the rural area of Ondo State, here I am emerging as the Aare Ona Kakanfo. Several countries, such as the United Arab Emirates (UAE), Britain, Turkey, Singapore, Kenya, Ethiopia, South Africa, Ghana, Rwanda, Saudi Arabia and Israel have diversified their economy to tourism. I want to assure you that I will work with various stakeholders to turn our land into a viable tourist destination. In closing, let me express my profound appreciation to the Commander-in-Chief of the Armed Forces, President Muhammadu Buhari, Vice President Yemi Osinbajo, Senate President, Dr. Bukola Saraki and the Speaker of the House of Representatives, Rt. Hon. Yakubu Dogara, for their support. I want to thank our host Governor, Senator Abiola Ajimobi, for his immense contribution towards the success of today’s event. The Native American Code of Ethics Of 20 Rules For Mankind.